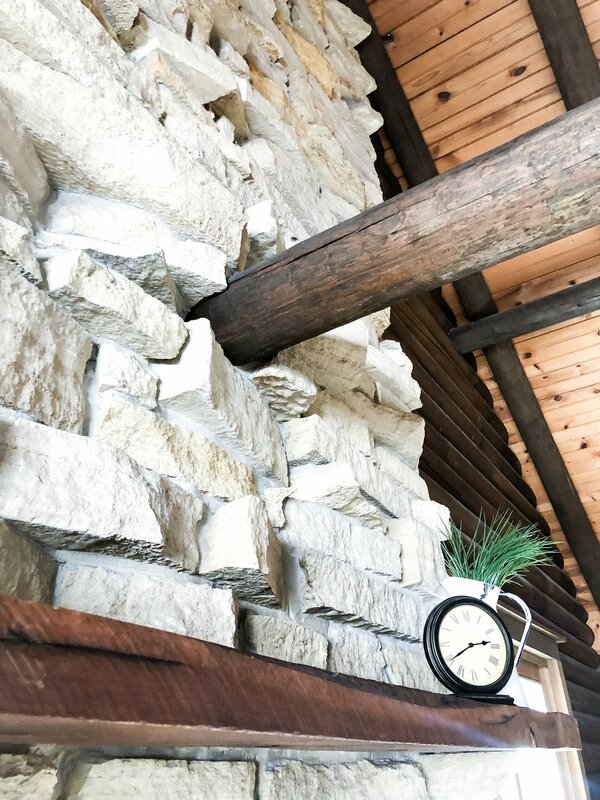 Knotty Pine Guest House-Cabin Getaway in Northeastern Iowa | H.Prall & Co. I am a creature of habit and that’s ok with me. As much as I love to see and do new things, there’s something very comforting about the familiar. That’s exactly what Knotty Pine Guest House has become for Jason and me. We had a chance to stay there this last week and it was just what this heart of mine needed, so I wanted to share a bit about why we stay there…and why it’s become one of our favorite spots! Several years ago, I came across a post on Facebook that was featuring several Iowa cabins that people could rent by the night. We had already been visiting Decorah, Iowa for a few years before that, so I was excited to find a place near there to try out! We first visited Knotty Pine during the winter, and it was just Jason and me. The house itself can accommodate up to 8 people, so it seemed a little silly for just us to stay there, but I didn’t even care. The setting was so beautiful and the cabin itself was cozy and had everything that we needed for a few days away. After we visited that first time, we had to book it again and go with our good friends. We had been going up to Decorah every year in the Fall for several years together already and we knew they would love this new place as much as we did! It’s located just outside of Ft. Atkinson, about 20 minutes away from Decorah, so making the trip into town isn’t bad at all. 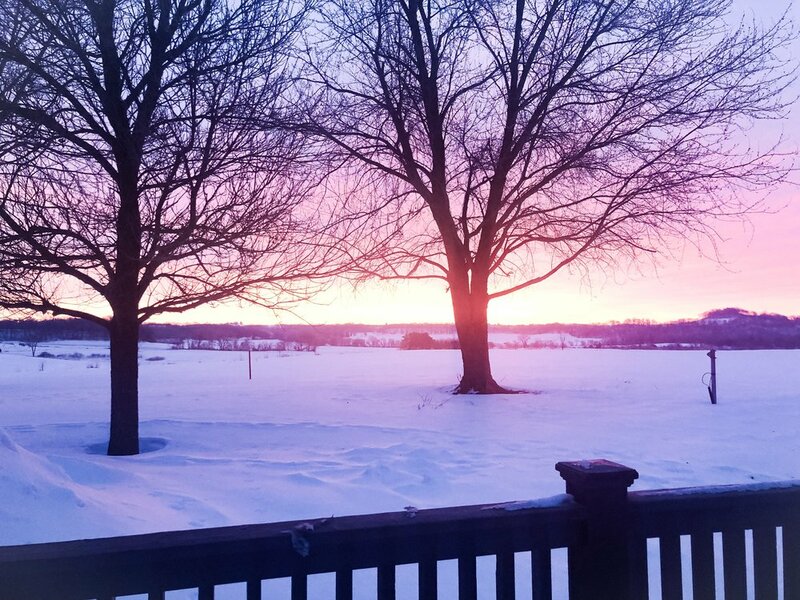 Truthfully, if you don’t want to make the drive, you can get or do just about anything you want or need to within Ft. Atkinson or Calmar, another nearby town, including groceries, restaurants, gas stations, biking/hiking trails, and water activities. We really love Decorah, though, so we usually make the trip in at least once a day while we’re there. One of our favorite things to do when we stay at Knotty Pine is to make all our elaborate plans for eating there. This is seriously what we and our friends talk about the most the weeks leading up to our trip. We send links to Pinterest recipes back and forth…and, of course, have our requests of our favorites from each other. Want to know two things that are always on our must-have list? You can find them HERE and HERE. We normally bring pre-made snacks and meals along, as well as, visit the local grocery store to get anything additional that we might need—we usually eat two to three of our meals at the cabin. All the basic cooking and dining supplies are provided, so all we need to do is bring the food. There is a grill for the warmer months, plus a stove/oven, microwave, and full-size fridge. Jason’s favorite kitchen feature is the coffee maker. He’s always up before anyone else, brewing some locally-roasted coffee from Impact Coffee. Now that we’ve stayed at the cabin for several years, it feels like home. We know exactly where to turn to get there, how it will smell when we open the door for the first time, even where each of us will sit while we’re relaxing in the living room. I love that we have a place like this that we can call our home away from home. It’s even more special knowing the history of the property. The current owners of the cabin are Jeremy and Stacy. They, along with their two boys, live on the property, as well, but you won’t see their house from the cabin. Knotty Pine was built by Jeremy’s parents in the late 1970’s and he was lucky enough to be raised there! After his dad passed away and his mom moved to town, the family was left with the decision of what to do with the cabin. Jeremy and Stacy wanted to keep it in the family as a legacy for their boys, so they decided to see if there would be in any interest in people renting it for short stays. Knotty Pine was one of the first short-term rentals in the area, but that didn’t hinder it at all. Weekends book-up a year in advance and they continue to have repeat and new visitors! I can attest to its popularity…we normally stay a weekend in September and to be safe, book our next year’s stay while we’re up there. I don’t want anyone taking our spot! Ha! While it’s only ever been the four of us who have stayed there, I think this would be the most fun spot for a family getaway or even a girlfriends’ trip! There is plenty of room for everyone to spread out (3 bedrooms and 2 full bathrooms), plus plenty of space to enjoy outside (during the nicer months). Knotty Pine is a place that we’ve been lucky enough to make lots of memories with our good friends…and plan to make many more in the future. I can’t recommend it any more highly. 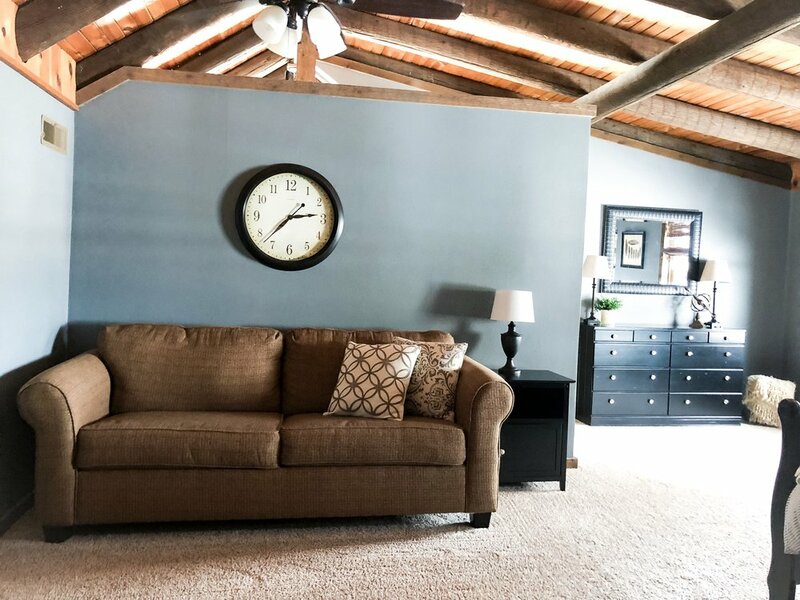 It’s a cozy place to call home when you’re visiting Northeast Iowa and a great place to decompress from life’s stresses and reconnect with your people. There’s lots of great shopping along the thriving main street—you’ll find something for everyone. Plus, you can’t go to Decorah without enjoying some type of outdoor activity. We love biking and canoeing for sure…and you can rent whatever you need for that in town—a plus when you’re traveling. Good food is a huge plus for us and while we’re in the area, a few of our favorite places to eat are: Magpie Coffeehouse, Mabe’s Pizza, Don Jose Mexican Restaurant, The Whippy Dip, Beyond the Bar, Oneota Coop, and Rubaiyat. 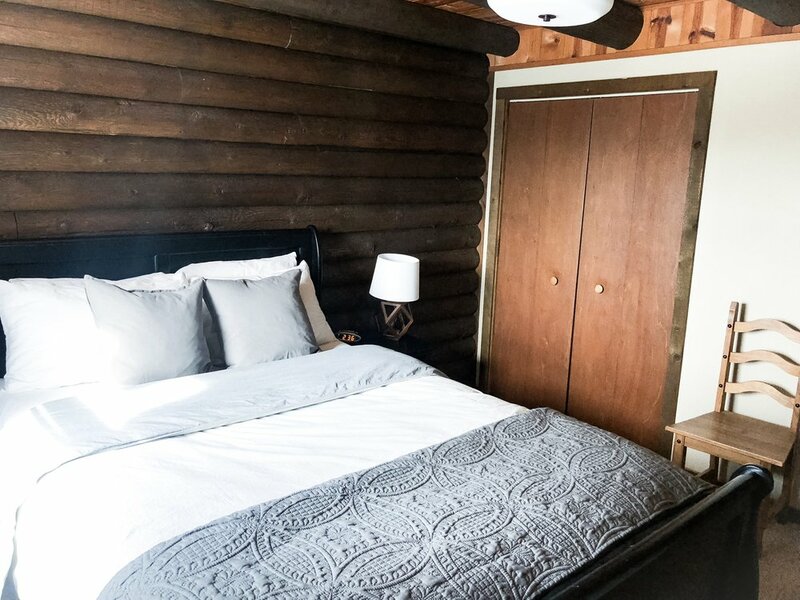 There are so many more places, even closer to The Knotty Pine Guest House…these are just a few of our tried and true faves. Jason and I attempted to try somewhere new the last time we visited and just couldn’t bring ourselves to do it! Our faves have our hearts! Isn’t that what tradition is all about? Visiting places that you’ve already been because you have good memories there? 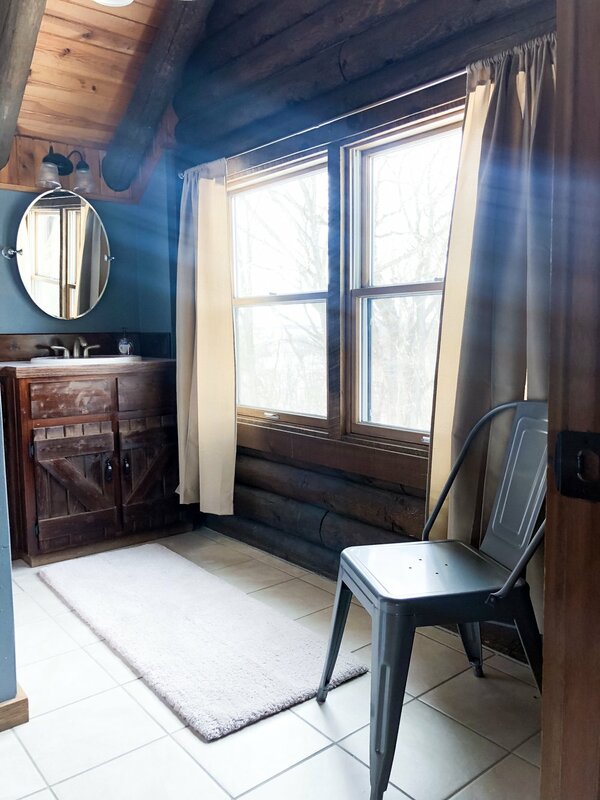 I hope you’ll consider making a stay at Knotty Pine a new tradition…you will be so happy you did!